On Saturday, September 24, 2016, the Smithsonian Institution will open its newest museum in Washington, D.C., the National Museum of African American History and Culture. 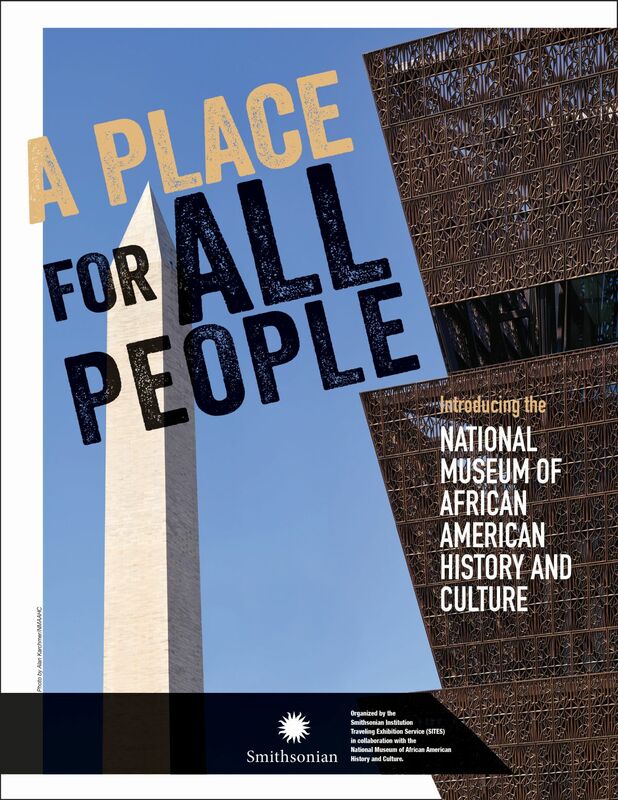 The celebration will reach beyond Washington to North Carolina as the Greensboro Historical Museum presents “A Place for All People: Introducing the National Museum of African American History and Culture.” The commemorative poster exhibition will be on view September 23 – November 13, 2016. Organized by the Smithsonian Institution Traveling Exhibition Service (SITES) in collaboration with the National Museum of African American History and Culture, “A Place for All People” highlights key artifacts that tell the rich and diverse story of the African American experience. From the child-size shackles of a slave and the clothing worn by Carlotta Walls on her first day at Little Rock Central High School to Chuck Berry’s Gibson guitar, “Maybellene,” and the track shoes worn by Olympian Carl Lewis, the exhibition presents a living history that reflects challenge, triumph, faith and hope. The poster exhibition and related public programs are an opportunity for the Greensboro Historical Museum to showcase its work in sharing the many stories of African American and African diaspora people and their contributions to the local community and the American story in the Voices of a City: Greensboro North Carolina exhibition. The journey to establish this museum began a century ago with a call for a national memorial to honor the contributions of African American Civil War veterans. After decades of efforts by private citizens, organizations and members of Congress, federal legislation was passed in 2003 to create the National Museum of African American History and Culture. Since then, thousands of artifacts have been collected to fill the inspiring new building that has risen on the National Mall. Through its exhibitions and programs, the museum provides a shared lens to view the nation’s history and the possibility for hope and healing. It is a place where all can gather to remember, reflect and embrace America’s story: a place for all people.